When I started gardening, I was immediately taken by the generosity and community that exists between gardeners. After years of working in corporate marketing, I was used to competition among colleagues and it always felt so wrong to me. But with gardening, it was a whole different dynamic. Gardeners share their harvest, their plants, and their knowledge. They give you their time and expertise and want you to be the greatest gardener you can be. And when those gardeners are also women, the community becomes more like family. 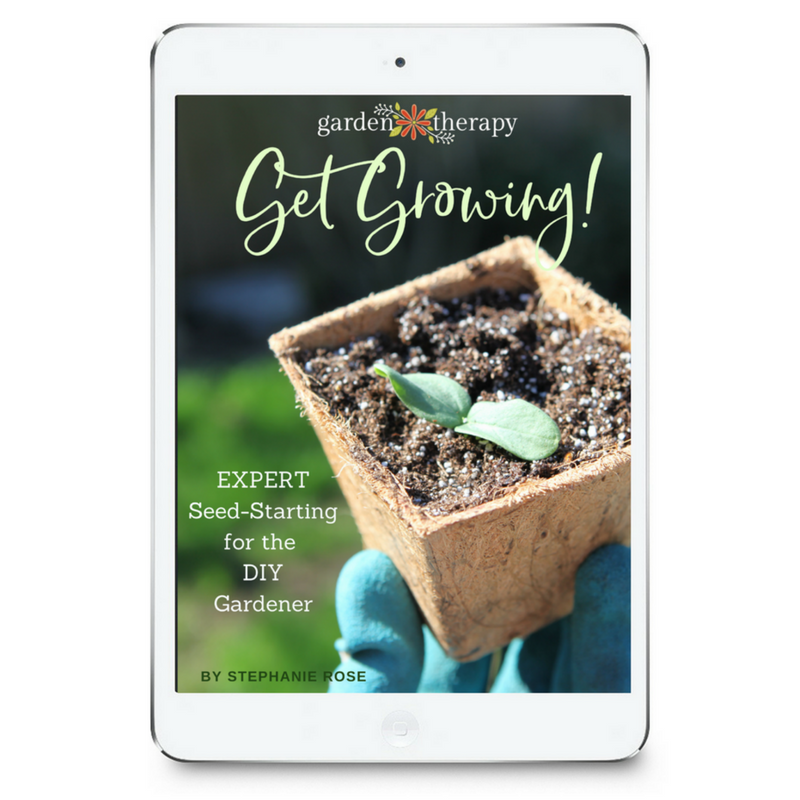 Be sure to catch the giveaway of my seed starting ebook, Get Growing! at the end of this post. Earlier this year we published a post called Crazy Plant Ladies Through the Ages: Women Naturalists, Botanists, and Horticulturists Who Made History that featured women who broke barriers and made history through gardening and plant sciences, which got me thinking about the women gardeners I know and all of the amazing things that they do. They are blooming with the love and joy of this wonderful world of plants, and they need to sow the seeds with others. As gardeners, we are a tribe. 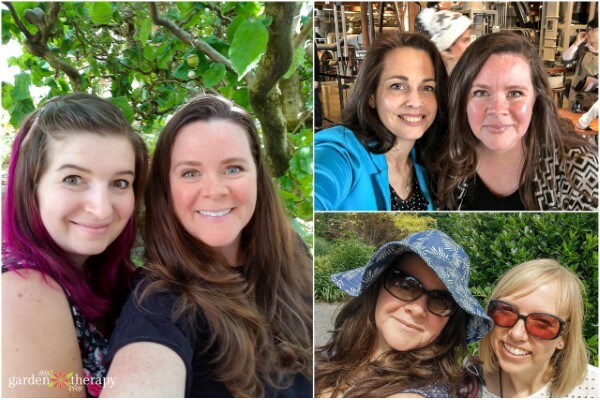 And through starting Garden Therapy, I have been fortunate enough to be part of a tribe of brilliant, passionate, and talented women to grow with (both literally and figuratively). As gardeners and as people, the time for working together is now. To work with the earth. To feed ourselves and our planet. I am fortunate to know a number of fascinating women who are working hard to create gardens, art, and change in this world. We are not related. We don’t even live in the same city, province, or country. But we were brought together by a shared love of plants. We work hard to lift each other up and provide support to each other. 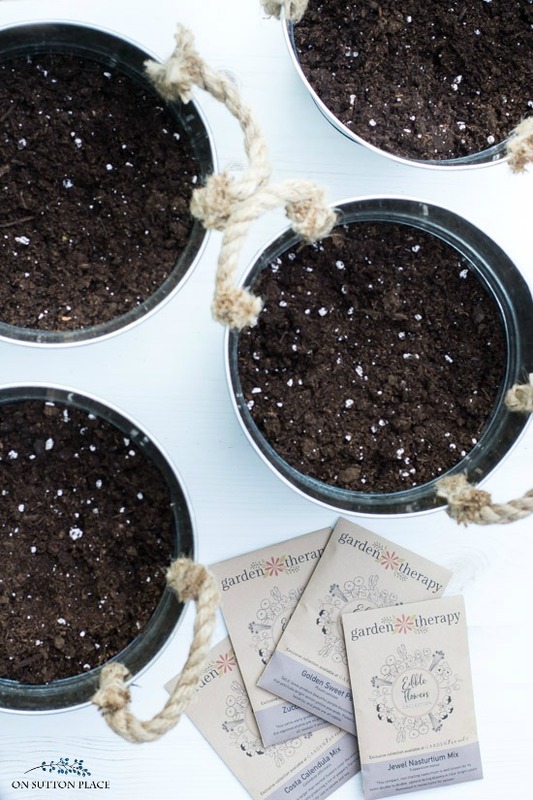 After creating the eight different themed garden kits in the Garden Therapy Seed Collection exclusively for GardenTrends, I knew I wanted to send them out to my tribe to see what their take was on the collection. I asked seven gardeners, each with a unique area of expertise, if they would like to try out one of the kits in their garden and give me feedback on what is working and what is not working for them. This is no small task! To grow a garden from seed takes a lot of work and dedication. I can’t even tell you how thankful I am to know these brilliant women and have them share their knowledge and gardens with us. The kits were sent out in the spring and so most of the trial gardens have been growing for a few months. I’ll post more updates on social media and write another round up of the results of the trial gardens in the fall. But for now, let’s meet the gardeners! Niki picked this kit to try because of her love for ornamental edible plants as well as interesting edibles. 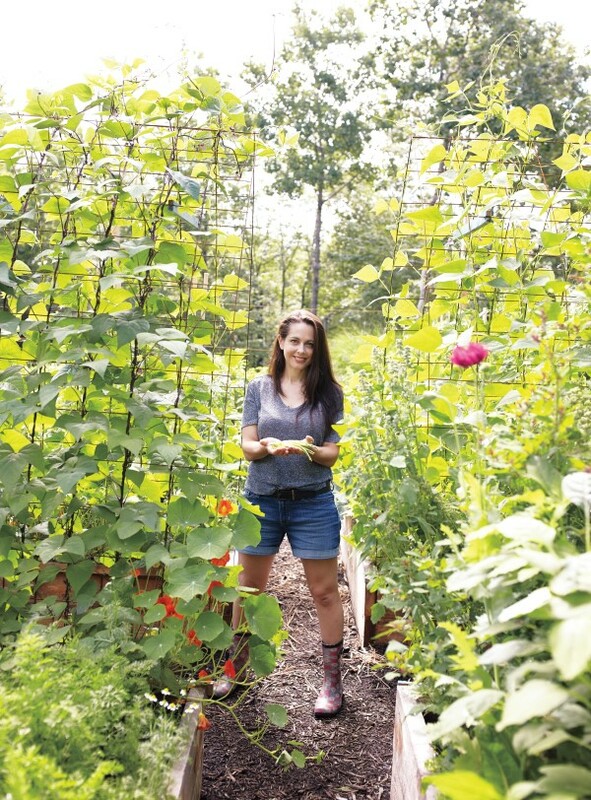 Niki is growing the seeds in her 2,000-square-foot garden in Halifax, Nova Scotia. She is the author of multiple amazing gardening books (including one of our new favorites, Veggie Garden Remix and host of the radio show The Weekend Gardener. 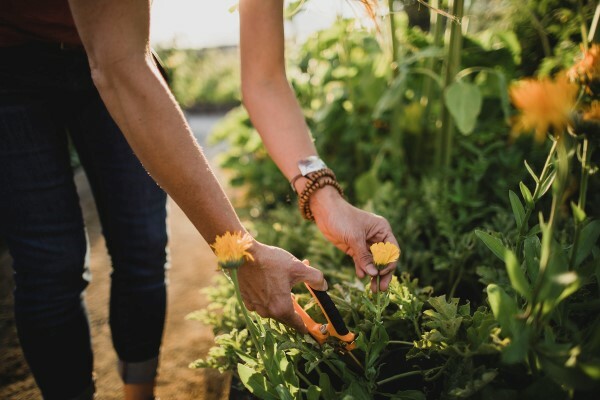 She’s dropped by Garden Therapy a few times (see her tips here and here) to share her gardening wisdom, which is a great honor considering she is a world renowned vegetable gardening expert who is changing the face of how people grow edible plants and feed their families. Check out the links below. Niki has given us a look into her trial garden and showed off the Garden Therapy Ornamental Edibles Seed Kit as it grows! First of all, she made a Facebook Live video showing us the collection. Niki did an Instagram story on all the beans she is growing. The last one is the Purple Pod pole bean from the kit, which is an Heirloom variety that produces delicate and flavorful purple beans on vines with dark stems and pretty purple flowers. You can also see her Instagram post on the two corn varieties, Double Red sweet Corn and Glass Gem ornamental corn. I can’t wait until she harvests them! On Twitter, Niki shared an image of how her garden was growing as of August 3rd. Isn’t it beautiful? And here’s an even newer post from her on how her garden is doing now! Yum, look at that corn grow. And Niki isn’t done planting yet! She’s getting her chard and lettuce from the kit into the garden right now for a fall harvest. Be sure to follow Niki on Instagram, Facebook, and Twitter for all of her updates. If you haven’t read Emily Murphy’s bestselling book Grow What You Love, you’ve just got to! 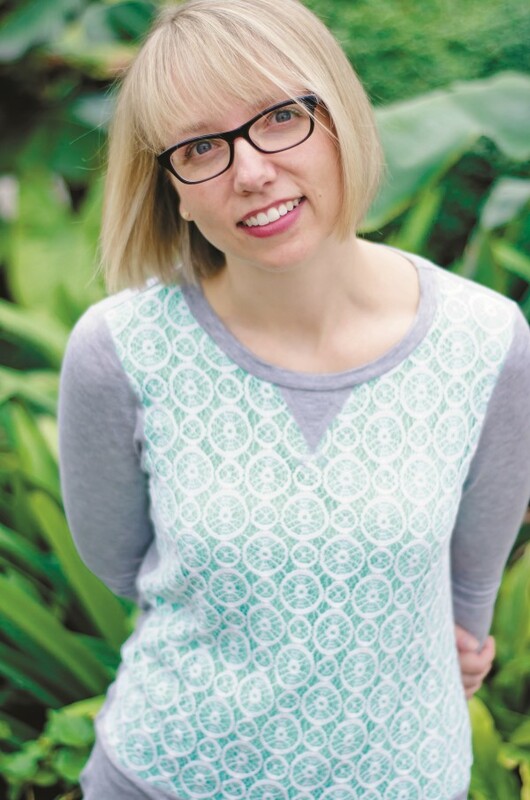 Emily is an author and gardener whose love of plants is rooted in her childhood summers spent in her grandparents’ garden and in her formal training in Ethnobotanical Resources. Her book and blog are brimming with science-based gardening tips that help you become a better gardener while falling in love with plants. Want to see for yourself? Last week Emily did a wonderful segment on late season gardening on the Today Show (yes, that Today show!) 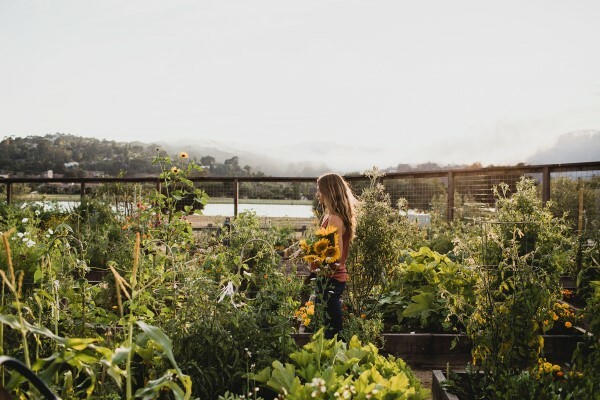 where she demonstrated how to protect crops to extend the season using a DIY hoop house, how to harvest some beautiful herbs, and even how to bring herbs indoors for the cooler months. Hearing her say, “when you grow what you love, wonderful things happen,” warmed my heart. This woman truly lives and breaths this message and that’s why I was thrilled that she requested the Garden Therapy Patio Pollinator Kit. Emily is dedicated to natural gardening and supporting beneficial insects to grow what she loves. You can see what she has to say about it in this Facebook Live video and this blog post. 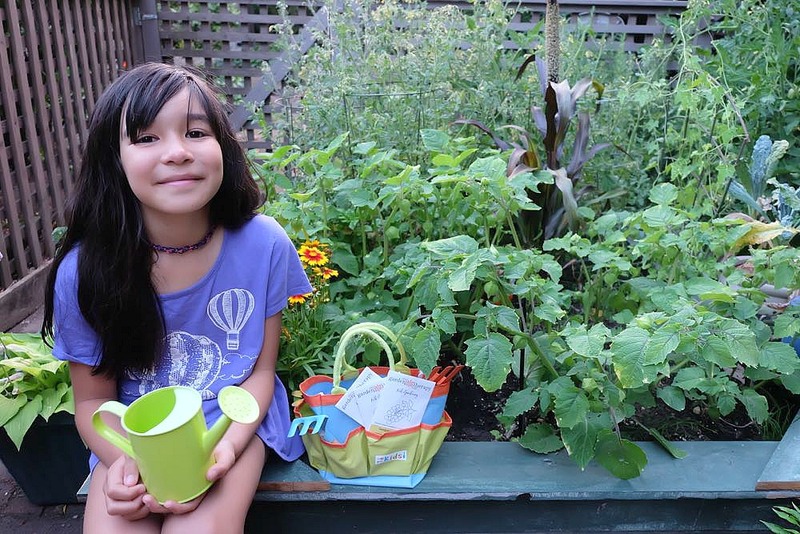 Follow Emily on Facebook, Instagram, and YouTube to see her garden grow. Crystal Allen is possibly one of the most creative people I know. I mean, you should see the birthday card she made me. It’s the prettiest thing I have ever seen! Crystal is also a mom to two smart and very creative children Bella and Adam. And her hubs, Rob, is pretty darn crafty himself. 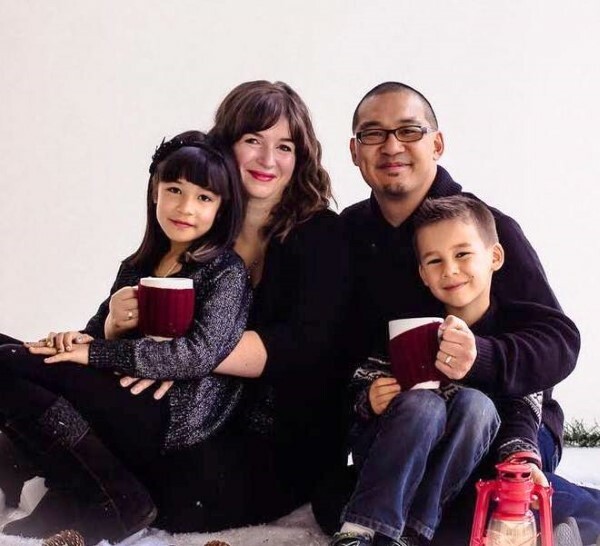 That’s why Crystal created a website for creative families. Not just kids’ crafts or adult projects, but creative pursuits the whole family can work on together. 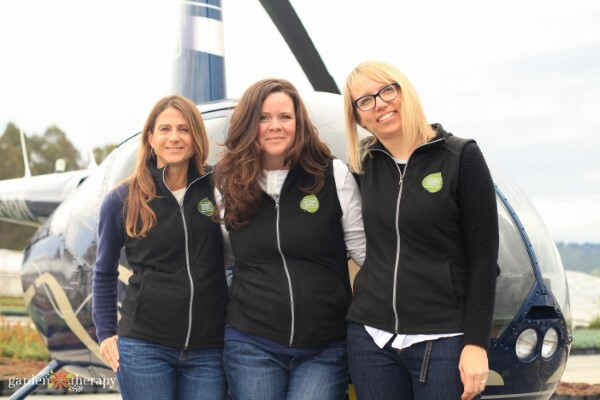 She infuses her family life with creativity through crafting, cooking, and gardening. I asked if her creative family would like to grow the Garden Therapy Kids’ Garden Kit. I went to see it a few weeks after planting and it was growing better than mine! This woman is a force. 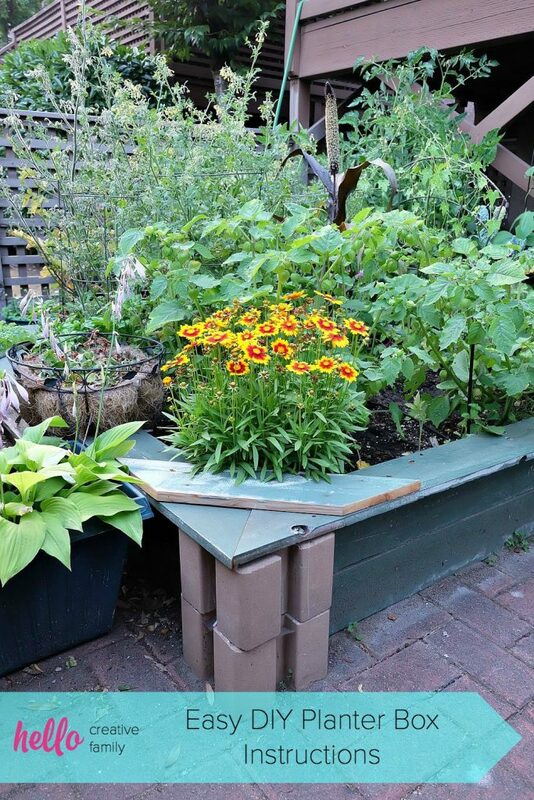 As an example of how she takes everything to the next level of DIY, she not only grew the Garden Therapy Kids’ Garden with her family, she also made her own raised bed for it. You can see how she made it here. 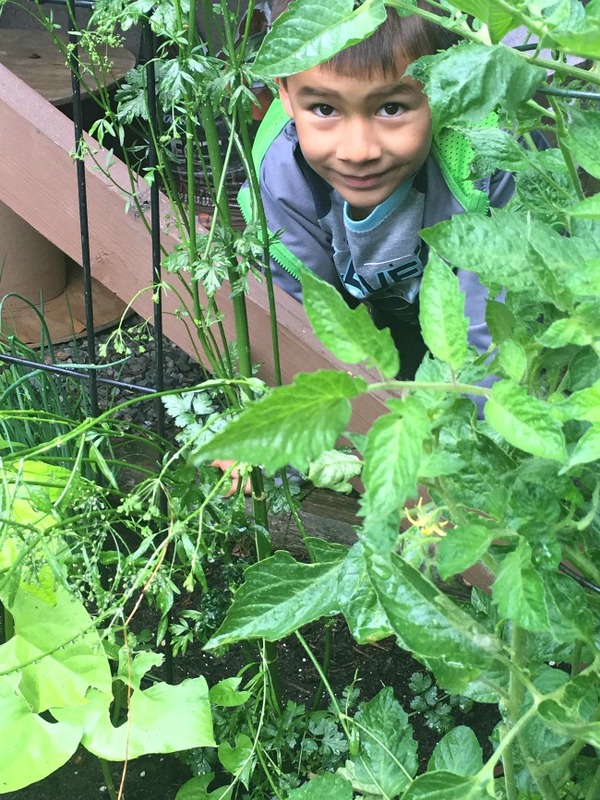 Crystal’s garden is looking beautiful and I love seeing her family get involved in the Kids’ Garden. She has been taking us along the way on her Instagram stories as well. Be sure to follow her there to see all the updates as she grows and harvests the veggies with Rob, Bella, and Adam. You can see her Gardening Highlights reel here. Crystal has also been sharing updates on Twitter and Facebook, so check those out and follow her there as well! 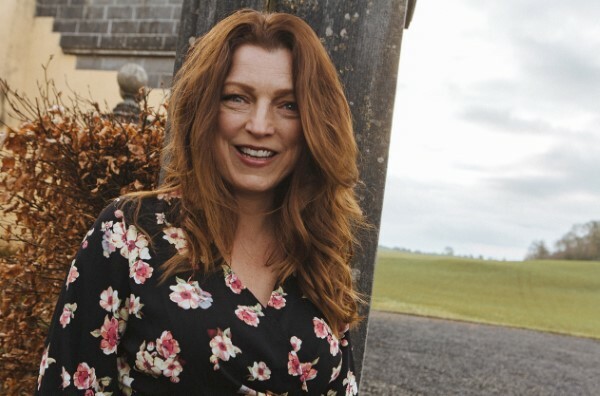 Shawna is an author, photographer, and speaker who has devoted herself to finding a better and healthier life through natural living and gardening. Shawna details her struggles with chronic pain and how she manages it through gardening in her book The Wellness Garden. She’s been trying out the Garden Therapy Mason Jar Sprouts Kit and we couldn’t be happier with the results! Shawna has had an amazing reduction in the pain she suffers from on a daily basis by adopting an anti-inflammatory diet. She helpfully shows her recipe ideas and meal options on her blog and on Facebook. 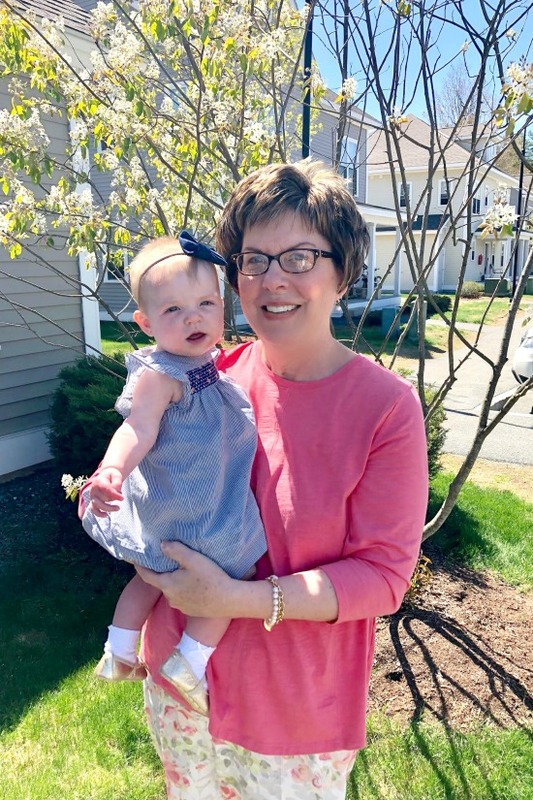 When Shawna and I went out for dinner together a few years ago, she immediately apologized for how she was going to order off the menu, being on a strict diet that limits sugar, dairy, and simple carbohydrates like bread and pasta. I told her not to apologize because I was on the exact same path – I also eat an anti-inflammatory diet to control Fibromyalgia. We have so much in common already, but now we can eat together and celebrate good food that promotes health. Well, who better to try out the Sprouts collection is there than Shawna? No one! Shawna is new to sprouting so I’m hoping that this easy and super nutritious way to grow foods that not only don’t trigger flare ups, but are so packed with healthy nutrients will get Shawna to start including these homegrown greens in her meals regularly. 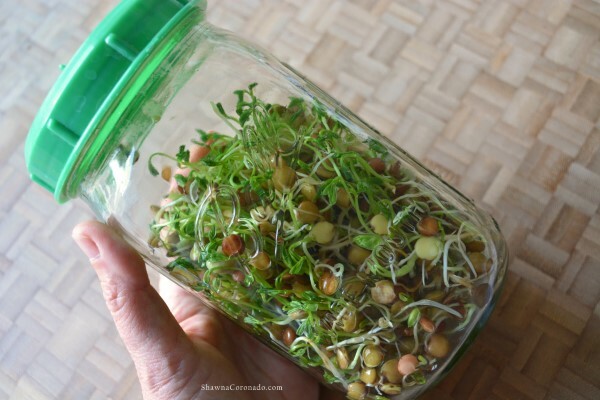 Shawna posted a brief summary of how she grew the sprouts here and a more in-depth blog post about her experience using the Mason Jar Sprouts Kit here. Keep up with everything Shawna is doing by following her on Facebook, Twitter, Instagram, and Pinterest. Ann Drake is the creator of the wonderful blog On Sutton Place, which highlights artful ideas for the home from vintage décor, DIY projects, recipes, and creative inspiration for all things domestic. Ann also shares what she’s doing in the garden, and this season she has been testing the Garden Therapy Edible Flowers Kit. I am just over the moon that she agreed to try this one out! 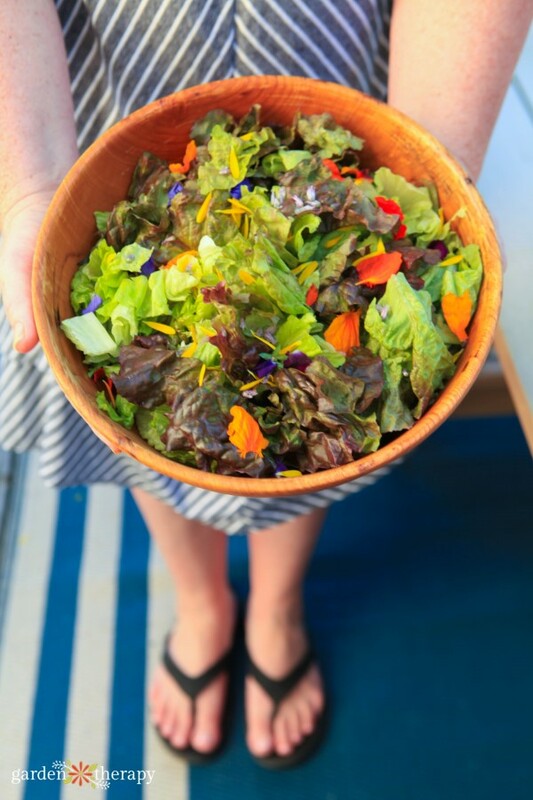 Ann makes the most gorgeous recipes and I’m pretty excited to see what she can do with edible flowers. 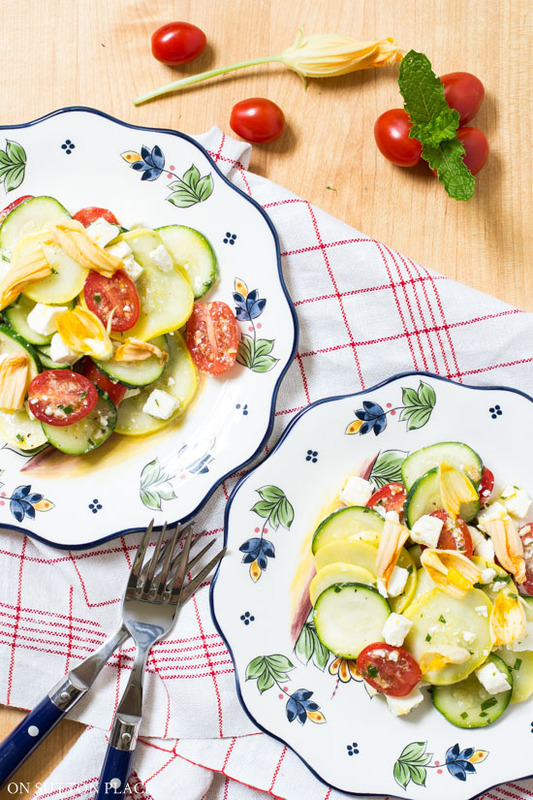 She recently shared this recipe for Squash Blossom, Zucchini & Tomato Salad and it’s just stunning! I love her tip about cooking the zucchini as well. I would never have thought of that! She was perfectly up front with me and told me she had never started seeds before. To which I thought, perfect! She is such a great gardener and chef that I just has to see how she could make something beautiful from seed. See what she had to say about it when she first planted it and now that her garden has had some time to grow, you can see what sort of culinary creations she’s been whipping up with her edible flowers! Follow Ann on Facebook, Pinterest, and Instagram for all her latest updates. Trialing: Garden Therapy Natural Beauty Seed Kit. Tara has told me a few times that she has a deep passion for crafting. She pines for time to get crafty and when I asked what kit she would be interested in trialing, she picked the Natural Beauty one, of course! 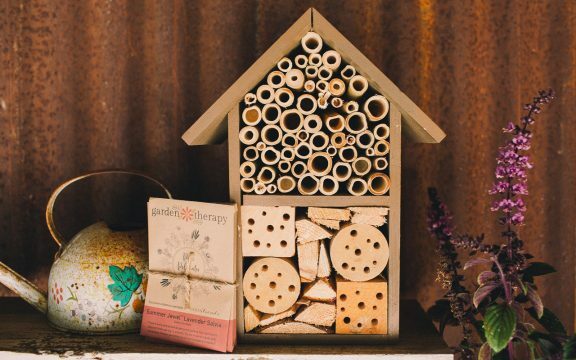 This kit comes with seven varieties of seed and a recipe book full of crafty ways to turn your garden-grown goodies into beautiful skincare and bath products. The seeds in this kit take a bit longer to grow, as half of them are perennials she will be growing and making things for years to come! 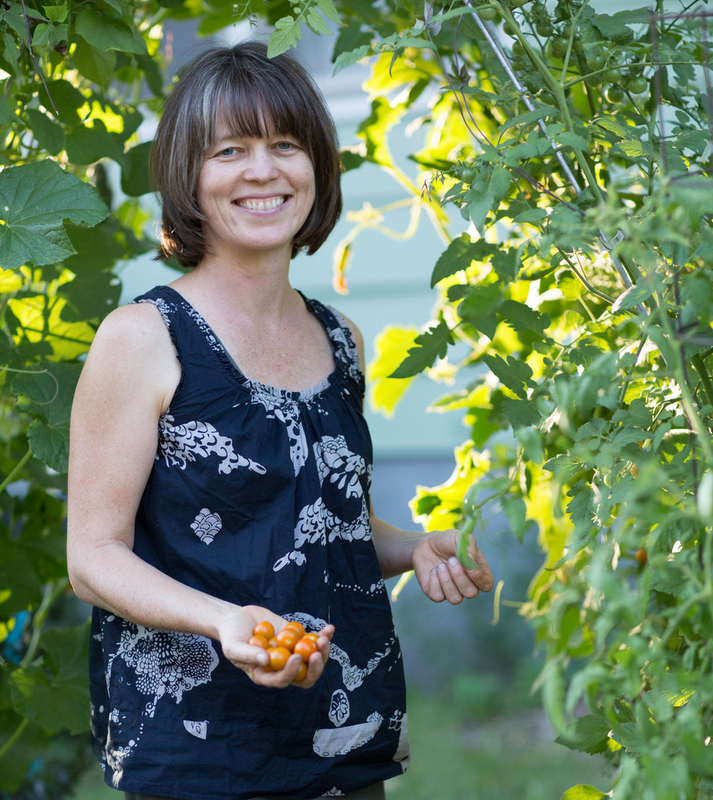 Tara is a writer and editor with a diverse field of interest, but she spends a lot of time writing about and working in the garden (have you read her awesome book Raised Bed Revolution? You should). 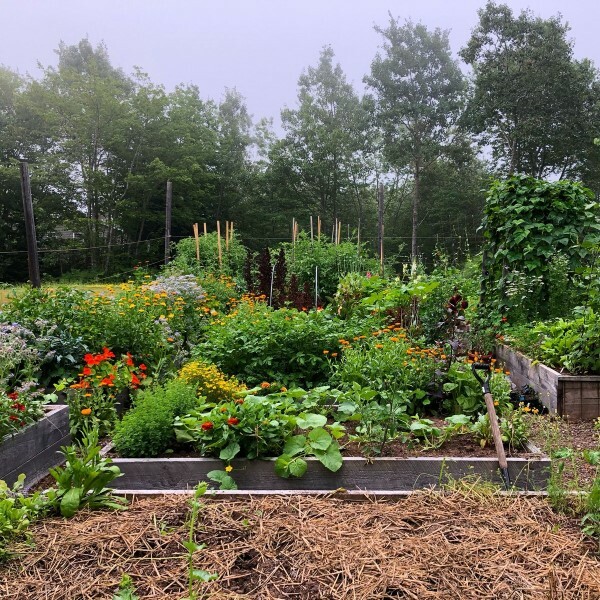 She writes about crafty gardening, small-space gardening, urban gardening, edible gardening, and more, and I’m thrilled that she is growing a Garden Therapy trial garden. Her projects will be coming soon as the harvesting begins. Tara just posted that she’s harvesting her cornflowers, so I can’t wait to see what she does with them! I’ve been growing the Natural Beauty Seed Collection in a raised bed to channel Tara (and perhaps encourage her back to Vancouver for another visit *wink wink*). 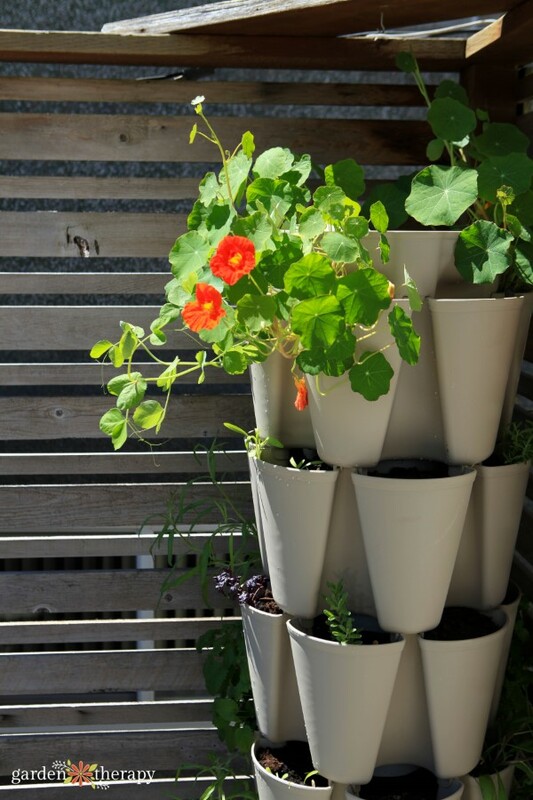 My garden is planted with the Edible Flowers collection in this super cool GreenStalk Vertical Planter. Stay tuned for what Tara creates by following her on Savvy Gardening, Twitter, Instagram, and Facebook. Megan Cain describes herself as a minimalist when it comes to gardening. The less fuss, the better. 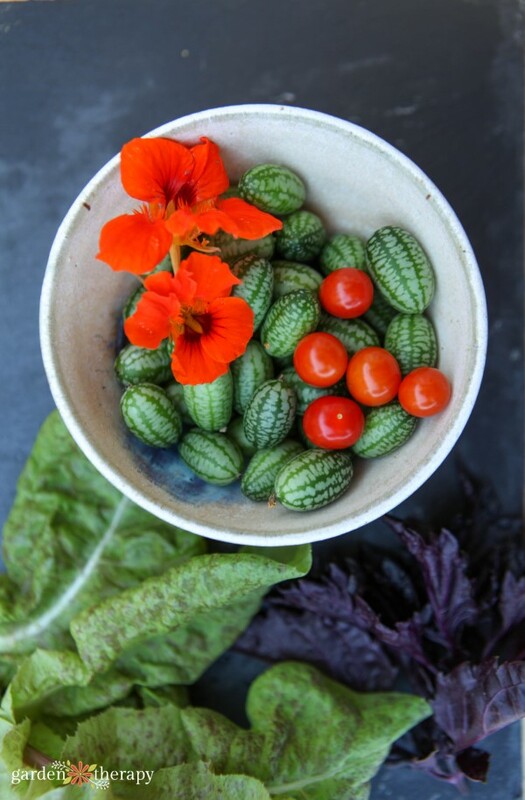 She is all about easy, joyful vegetable gardening and her wonderful blog, The Creative Vegetable Gardener, is full of tips on how to achieve just that, and she has been growing the Garden Therapy Superfoods Garden this season. Megan has just started planting the beets. We are excited to see how it all comes together! Superfoods is one of my favorite collections (although I really do love them all so much). 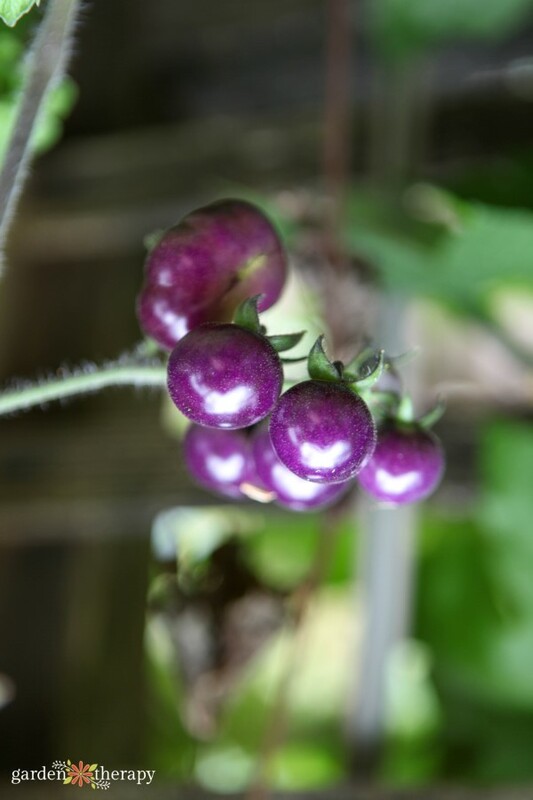 I have had a lot of fun with the Indigo Blue Berries Tomatoes – they change from black to blue to purple to red and brown as they ripen because they are loaded with anthocyanins. These could have easily been in the Ornamental Edibles collection as well, they are so pretty! And, finally, I have been trialing the Window Herb Garden Kit myself! Well, actually, I’ve been trialing all of the kits, but since the Window Herb Garden Kit is almost sold out already, we didn’t want to take one out of stock for a trial, which means I couldn’t send it to one of my friends. My herbs are doing beautifully, though, and I am now officially addicted to Purple Ruffles Basil. 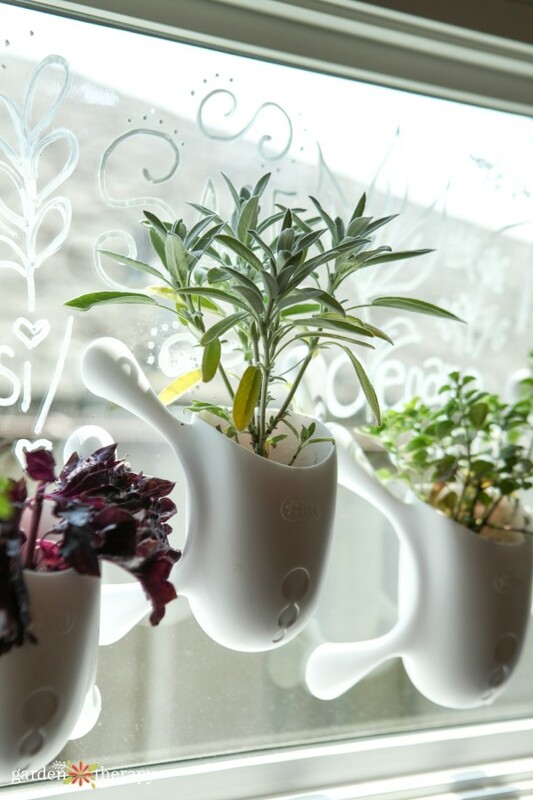 You can read all about how my window herb garden is doing in this post. Win a Copy of Get Growing! Comment to win giveaway for a copy of Get Growing! This is open worldwide except where prohibited. The winner will be chosen at random on March 31st. 2019 and notified by email. To enter: leave a comment on this post telling me what your favourite Garden Therapy seed collection is. My favourite seed collection is the Patio Pollinator . 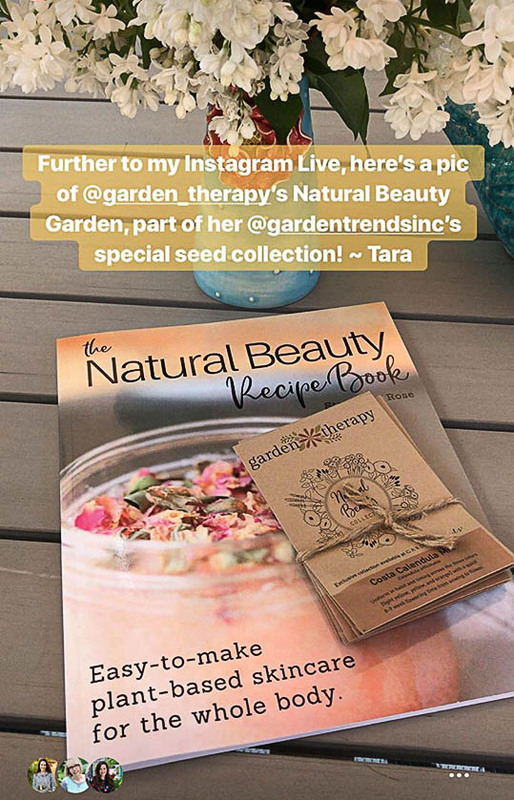 I love the idea of the Garden Therapy Natural Beauty Seed Kit – to harvest the bounty and then preserve it’s beauty by using it on yourself really appeals to me. I feel vibrant about the natural world and love the idea of integrating flora (the garden plants) and fauna (me)!